First commandment of the Finnish summer: Spend as much time as you can outdoors. This is a good rule, which can be carried out in many forms (we’ll bring some ideas in the near future); one of those forms is the “official” Finnish summer game: Mölkky. 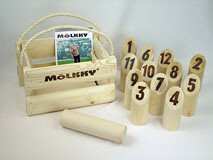 Mölkky is a very popular game, a bit like bowling, except you can play it anywhere – there is no special place to play it. It also relates to boccie, but Mölkky has characteristics that sets it apart from the other two games. The basic gear to play this game is a series of pins with numbers written on the top of each one. There is also a pin that has no number. This is a set of Mölkky pins. The numbered pins are like bows in bowling. You have to place them in a triangle and the number that appears on top of each stick tells you the number of points you get if you knock it over, but we’ll see the rules in detail in a second. You use the unnumbered pin to knock over the other pins. The players throw the unnumbered pin in turns, trying to knock the other pins over. The goal is to reach exactly 50 points, and this is how you count the points: If you knock over one pin, you get the number of points written on it. If you throw down two or more, you get as many points as pins you’ve knocked over. Here you cam see someone throwing the unnumbered pin. This is Mölkky. The first person who gets 50 points wins, and if someone goes over 50, he or she gets a penalty of 25 points less and has to continue from that number, trying to reach 50 again. Mölkky was invented not long ago, in 1996, by Tuorengas , who owns the game name’s trademark. It is an educative consortium from the Lahti region, dealing mostly with reemployment and job searches. The game has been picked up by university students and since 1996 its popularity has been on the rise. 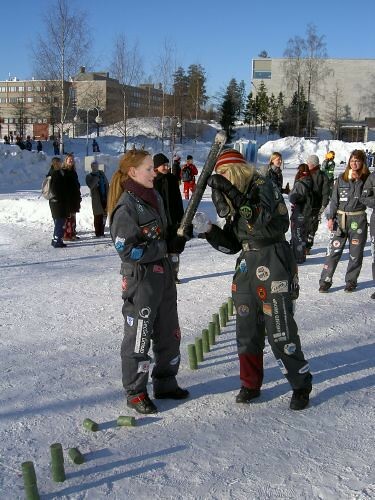 Each summer, a world championship of Mölkky is held in Lahti. 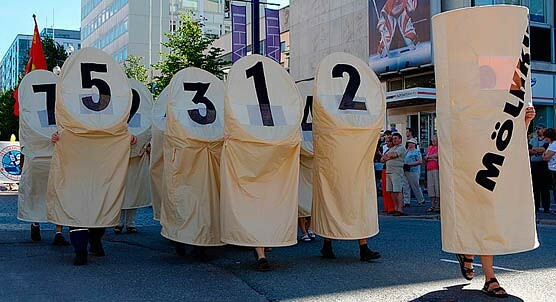 A funny photo of a group of Finns disguised as Mölkky pins. The game is also played in places like France, Australia or USA. Tuorengas has sold about 200.000 Mölkky sets – not a bad number. Have you ever played Mölkky? How do you like the game?